Who do men say you are? Here's what they say I am! 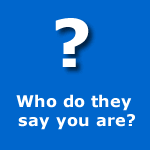 →Who do men say you are? Here’s what they say I am! Who do men say you are? Here’s what they say I am! Are you a successful blogger? How long have you been blogging? What do other bloggers say about you? Are you real or fake – Not like these fake bloggers though. I mean, are you really the bad blogger? I have been in this industry for 2 years now (Read about my 2nd anniversary here) and I have been so amazed what I read about me on other blogs. In this post, I want you to see what people say about me and why they say such things. Yes, my name is Enstine Muki. I’m a cool guy from Cameroon in Africa and I’m 36. This moment, I live in Douala Town. I’m father of 2. My wife is the most pretty woman on earth. Sorry but she is more beautiful than you, your sisters, your own wife ( if you are a married man). No offense! It’s not my fault. I didn’t make her 😉 She’s just my queen and that ends it there. Well, I made some popular bloggers to openly accept on Google+ that they are fake. NB: These are just few testimonials I pick from around the internet. A lot has been said about me and I’m speechless. Thank you guys for the positive confessions. As a matter of fact, my secret is that I don’t have any. I just try to be smart while working hard. In any case, I must tell you where my strength comes from. The list is quite long but I’m ending here. Note also that I have a relationship with these and more bloggers. That’s what counts. It’s not just because your blog is cool. It’s because we are pals and that’s what I love. So check out those blogs. I’m sure by reading them, you’ll gain knowledge and that will make you awesome too. So who are they actually saying you are? What do you think I am? I can’t agree more Enstine, but you have really given much to the blogosophere that all these which these bloggers, friends and followers have said about you is exactly who you are. When I look at you all I see is a smart blogger! Yes you work so smart that everything that happen around you fits in. I mean this what blogging is meant to be Enstine. You have earned yourself a place in the blogsophere and permit me to say that you made it because you have awesome friends who see you as their own. I have tested a fair portion of this myself. Since I came to know you as a blogger, I have been able to hit targets I never believed I would hit at least not this early. I was able to meet these wonderful bloggers who you have mentioned today because I tapped into your smartness! You are very correct when you mention that I have made it because of my friends. That’s exactly the strength behind my success. My friends are awesome and I’m happy that we are all growing together. Mr Enstine Muki, I hope Am Right Spelling your creative name lol.. Anyway ever since I have known you, you have been an inspiration to me, your articles are more of creativity and reality which every man and woman who are into blogging need to strengthen our blogging career just as we do listen to the word of God to strengthen our Faith. I must confess that I am truly impress seeing with your knowledge of blogging. Well, I think everyone say because you actually are a smart guy! I have learnt much from your blog since the start and I am still learning much and I am sure in the future this blog is going to rock more and more and will become a basic hub of learning for the newbie bloggers. Thanks for your efforts Enstine! Thanks for being an active member in my community and for being sincere. We are learning from each other and I’m working hard to make this blog a wonderful spot in the future. They are all right. You’re really great and you always share great information with us. In short I would call you fake 😉 You know what I mean. Don’t you? I loved to hear what others think about you. Everyone here is appreciating you just because of your smart and hard work. Do you know the quote? “Hard working bloggers Shine and Hardly working bloggers whine” ? 😛 You’re shining one. Though there are some whining bloggers who don’t know about Enstinemuki.com, the day they will come up and read your blog they will also start making money 😉 Ain’t it? You know things are the way they are because of you guys, my community members. I’ll ever remain grateful for each and every minute you guys spend on my blog. Yes indeed, all that you do and the lives you touch with your wonderful networking and innovative ideas is outstanding. Thanks for mentioning a little of what I always say – you are a genius – there I say it yet again!! I am sure your wife is the prettiest and she’s so lucky to have you in her life (she’d be so thrilled on reading all that you wrote about her – must show it to her!) – God Bless you both and your loving kids. what a big pleasure to be mentioned alongside with these powerful names. I am so glad to have you in my circles, you are a volcano of ideas! There is so much to learn from each other, and the community is what make blogging awesome. Best is yet to come, as you mentioned in past. I’m so honored that we are friends and share a lot together. You are awesome at klinkk and NPI. You offer a lot of good stuff to your community members. Love begets love; it is applied for everything. It is said that the true art is found between two liars. One who knows claim to know nothing about it and the other one who doesn’t know always boast to know everything about it. You are a true blogger that is why despite being an expert in your field(s) remain so humble and supportive to all regardless of if they are either pro bloggers, struggling or newbie bloggers. I still remember how you first time mentioned my post very spaciously in your blog post and then people started recognizing me. I will ever be thankful to your for this. I am so proud to be in your friends list and do want to remain in it for learning more from you while interacting with you and visiting your blog. Have more and more success in your blogging journey and keep spreading knowledge and happiness with your versatile way of blogging. You know it’s a blessing to hook up with you. Your blog is filled with solid material. Your readers can confirm this. Though I have been so busy and kept off your blog and many others, you still continue to show love in sharing. That’s true support in friendship and I’ll every be grateful. Online reputation is just like living a real life in a real community. I hate it when we all agree to an article or post. Lets be real and support each other by always saying the truth for instance If a post has some error we should say it to that person for immediate change. As for me, when people realize that you are real then the will talk good about you just as everyone talks about Mr Enstine in a positive way. Vandefan recently posted…How can a gravatar help you build strong online identity. I totally agree with you. The way you build online cannot be so different from your offline reputation. BTW, how are you doing and your blog? This sounds great and call for an action! What do fellow blogger says about me? A big question… It takes time to dominate but once one is able to have his stand in the industry, certainly there will be a lot of recommendation and reckoning from a fellow! BTW how are you doing? Enstine Muki recently posted…Mobile Web Traffic is No Longer a Thing of the Future: Are you Ready? It will help your readers to gain more trust in blogosphere. It feels great when i found my friends getting so much of compliment. And one should except that you are genius as well as loyal bloggers, who is always ready to help. It’s Good to see my comment also in your testimonial. It is not just to show “How genuine i am” But you deserve this comments, you are really an helping guy. You had created BroadedNet a great platform for bloggers which helps to drive traffic without Social Media an search engine. I am waiting for it to get updated for blogger platform as well. So that i can share it with my friends who are on Blogger platform. Thank you so much for the kind mention, I really appreciate it – I am so glad that our paths crossed and that we became friends. I am blessed for having gotten to know you. Love the fact that you say you have no secrets,that you try to work smart while working hard – Got to love it. Both of these things will take you far. Your comment just landed when I was checking my guest post on your blog for any update. My wife has not even known I wrote this but I’m sure she will soon be on my blog to read it herself. It’s a good thing i was opportuned to visit your blog. Ever since i started reading your blog posts, i began to tap new ideas. You are so knowledgeable, extremely smart, very creative and a friend to all. Yes! all they have said about you is true, you deserve it and i’m happy to be a reader of this blog. More grease to your elbows, keep the good work going. Do have a wonderful time ahead! Thanks for the nice words bro. It’s really great to have you around. I know a lot lies ahead of us so let’s keep it warm. Without fear of contradiction, I sincerely say you are plain awesome – and super cool! All what they are saying about you is completely true – just that all your buddies (me inclusive of course), lack the proper adjectives to best qualify you. So sad – so we all settle for “awesome”, “great” “genius ” etc. If there were better words in the English language, we would have certainly used them! Thanks for the very kind mention. I certainly do appreciate and value your friendship. I challenge your earlier statement that your wife is the most beautiful. NO! My own wife is! How can any other woman beat the most beautiful woman ever to step foot in the world from its creation? lol Good to know your wife is beautiful. God is great to have created such wonderful damsels. She makes your world sweet right? My greetings to her. I have, Enstine – and she makes my world super sweet! Also, she sends her kind regards. So, when we meet for a cabinet meeting with Harleena, I hope you won’t be angry? (I’m still a loyal deputy, you know). Do have a super Saturday! So Excited, I Emerged the Winner of Blog Engage One Month DTFP Giveaway! So sweet to hear that Chandra. I wasn’t well so didn’t checked your blot that day.. Thanks for that quick reply. You’re really aware of thing which keep users engaged and happy on your blog. You are really commendable. I like the way you present and share others blog’s in your post. This is really inspiring and make me learn always from your writings. What the people say about you is all correct and you really deserves it. You are one of my favorite blogger in my list. You have done wonderful job by presenting “MyCommentAuthor” and “BroadedNet” towards us. These tools are really very helpful for us. Many thanks for this wonderful post and including my blog here in your list. You are one very special friend and I’m so glad we met. I love what you are doing there on your blog and thanks for being active on broadedNet and MycommentAuthors. I’m really encouraged and thrilled by your action. You have invited me a couple of times but due to ‘busy-body’, I have not been able to make it. I missed those wonderful opportunities. No issues. I can understand your condition. We all bloggers has very tight schedules with lots of work. We have to manage lot of things alone. Thanks for your kind words towards my blog. Enjoy your weekend! Thanks Enstine, for sharing this proof and actually I don’t need a social proof to say that you are one of the best blogger in the world. The tricks or tips that you have shared with us are really unpricable. I never thought that my testimony also included. Thanks for sharing and thanks for the blog list as well. My head! I should have added your url right? First of all, i would like to commend you for writing this blog post. I do feel amazed to see your blog titles and how deep you think when you come up with articles to write on your blog. If i would say, i don’t think you do run out blog post ideas. I feel honoured that you make mention of me on your blog. You give me a lot of inspiration to grow the blog within the shortest time possible. You are always around to help any day any time. I’m happy for you for having such as pretty and wonderful wife. I pray that God bless you and your family. Have a wonderful weekend brother. I have been working with you closely for the past few weeks and I’m really impressed how your are picking up. I’m very encouraged to give yo any assistance I can. Enstine Muki recently posted…Affiliate Marketers ~ How to make big commissions with this program! There is no doubt that you are the famous blogger like them. By add them its gain trust and build a strong authority of your blog. Really nice post & i am also starting follow them..
Enstine Muki recently posted…Who do men say you are? Here’s what they say I am! This post is so very creative Enstine!! Besides good informative content, I think people love being amused, entertained and inspired to chuckle! You do that so very well. Thank you for including me on your list of bloggers. Though we have only recently connected I already feel your integrity and good-hearted nature, as well as your vast skill as a blogger. As for you wife….Maybe one day you will post her beautiful picture on a blog post!! Have a wonderful weekend Entstine! Yes, I’ll post about my family on my wife’s birthday coming up in December 😉 I bless God for the wife and kids he has given me. Such a good thing! BTW how was your weekend? I hope this weeks brings in another freshness and success ! Social proof is a very good thing needed by all bloggers. Without it, blogging will become a trauma. I am glad that you have lots of social proof to show. That’s who you really are. Always getting better every day. You know all this is thanks to you guys in my community. That’s why I’m so excited each time I think of blogging. Thanks buddy for the beautiful words. I am so glad that my page is in your reading list! Your innovative ideas and inventions in relation to blogging is tremendous, and I am surely many are benefited by your presentations and gadgets. I appreciate and congratulate you for gathering such a lot of applauds from around the universe! You know this list won’t be complete without your blog. Besides, as an active broaded user, I’m always around your blog. Thanks for being a good friend (in fact, you and your wife). My blog and personality won’t be where it is without your input. I have only met you a short while ago but needless to say you have had a huge impact on my life out here in blogosphere. You are an excellent teacher. You are surely a leader in the industry. You are innovative and very creative with your work. Beyond that, I think you are CHEAP! It’s not been years since we met but I tell you I didn’t need them to see the value in you. For a short while visiting your blog. I picked some exciting materials. You won’t know and I don’t need to say more. Just keep up the work for I know you influence so many that read them. OMG! am I jealous? Why didn’t I think o f this before? If this is your meaning of CHEAP, who won’t like to be called CHEAP? I’d like to read a post on your blog about CHEAP bloggers/Businessmen/friends 😉 Will you post it? LOL Enstine 🙂 Is that a challenge or what? Looks like it to me and I am definitely going to take that one up. I will add to my to-do list. Have a fantastic day/week. Blessings! By the way I found very great stuff on your site and hope that will get more from here. Once again I thank you for commenting on my blog. I’ll gonna visit your blog for more post. After visiting your blog I’ve same opinion as the above members have about you. You’re really genius. Thanks for following up and engaging with me. I know we have better days ahead. Did you also checkout my two programs for bloggers? You deserve all of this and much more. You are one of the persons who inspires me every now and then. The way you blog and introduce products is very peculiar and I love them all. Thanks so much for the cool mention. You are one of the few bloggers, who can surprise the world. Never know, when you pop up something profitable for the whole community like Cashdonator, comment author plugin or broaded.net. Wow! that’s an amazing comment Rohan and thanks for being such a friend. I’m sure you know without you and your friendship, something will be lacking. Enstine you are one of the bloggers who writes out of the box posts and The way you review is simply amazing. Your posts helped me a lot to learn. So excited to read this comment Lakshman. I’m glad you are one of us here on this blog. The simple truth is that there are better days ahead for us. Enstine Muki recently posted…$100 Cash Giveaway ~ Straight to Paypal! You are one awesome individual. Thanks for the link in this post. I just wish I could have had some type of testimonial or great words to have said about you, just like some of the others did. But in a future post, that will certainly change. You’re one of the smartest, ambitious and amazing bloggers I’ve met and you continue to impress me with all that you do and your continuous dedication to building and improving your brand. Glad to have connected with you to witness not only this growth but also the great things you have in store for the future. Hope you have an awesome week, my friend. You are awesome and you know it! The proof is the engagement on your blog. You can’t even hide your qualities. Thanks for the beautiful comment and acknowledgement. Creating connections with each and every blogger is indeed helpful to grow your business. I’ll share this on G+ to show my appreciation 😀 . See you on your next updates buddy! Thanks for all you do to give me a lift. I recognize all your shares and every moment you spend here on this blog. This is one of the reasons I get those feedback. Even when you’re paying homage to others you always come up with some unique way of marketing and branding yourself! LOL… You know you are one of a kind! I like to congratulate you on your 2 year anniversary. I know it’s a a great journey that you’re on and it can only get better. I also like to thank you for mentioning my blog on the list of blogs you have here. It’s much appreciated! Sorry I’m just now getting by here but had to check out what everyone was saying about you. It’s always fun when you land on someone’s blog and they are either praising you in their content or comment section. Either way it’s just so very nice to hear. I appreciate you sharing my comment and that my blog is one you enjoy visiting. This to me my friend is the reason for building those relationships. We get a chance to meet you, find out a little more about you, build up a friendship with you and of course since we also love your content we want to support you as well. The more people you can do this with the more people you’ll get in front of and that’s how this glorious thing works. I’m not at all surprised by all the nice things people have been saying and you’re very deserving of it all. Now everyone can take a lesson from your book and start applying themselves as well. Thanks for this comment and complement sumit. We still have wonderful things ahead don’t we? I have no idea how I missed this article, but well done Sir!!! You are an awesome example of the type of person and blogger to follow. You’re an inspiration, breath of fresh air, and one of the most giving people I’ve met online!!! I’m so grateful for your friendship and I meant every word I said. I hope you have an awesome end to your week Enstine!! Don Purdum recently posted…How Do I Build A Business When It Fells Like I’m Always Failing? Needless to say that for the very short period we have met, a lot has been learned from you.